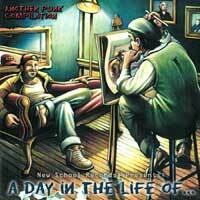 A Day in the Life Of... is a compilation, and the majority of the tracks come from the best demos New School has received in the past few years. Many of the artists have recently become part of other established labels, such as Nitro, Over Giver, Bettie Rocket and more. Genres range from pop punk to skate punk, giving listeners a chance to hear some of the best music from bands that haven’t yet hit it big. This compilation is a must for anyone who loves being the first kid on the block to know about up-and-coming bands!